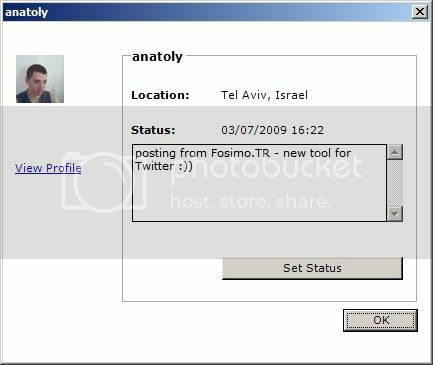 This is the 1st publicly available version of Fosimo.TR — free twitter client for windows ultimate tool which will help you keep track of your twitter account without browsing through twitter. Be updated instantly with your Twitter friends status updates. Synchronize Twitter friends with matching OUTLOOK contacts. For windows mobile devices owners - you should be able to see your contacts photos on your phone display. Autoupdate (Fosimo.TR autoupdates each time a new version is available). We will never ask you for your Twitter password and you don't need to enter one on Fosimo.TR (because Fosimo.TR fully supports oAuth authentication technology). Your Fosimo.TR will be updated automatically each time there is a new version of the product. There is no need to download uninstall and reinstall the tool each time. Follow updates on @fosimo and stay tuned.